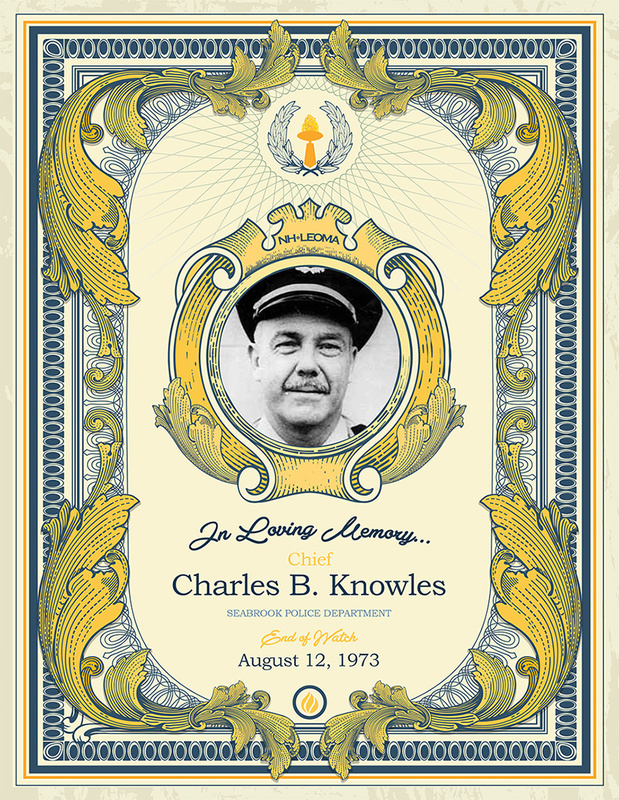 Chief Knowles was born in 1915 at Seabrook, New Hampshire, and was a member of the National Chiefs of Police Association and the Rockingham County Law Enforcement Association. He was a thirty-year veteran of the Seabrook Police Department. He was also a fourteen-year veteran of the Rockingham County Sheriff’s Department. On the evening of August 12, 1973, Chief Knowles stopped a vehicle on Lafayette Road in Seabrook and attempted to arrest the driver for driving while intoxicated. The driver resisted the Chief ’s efforts to arrest him and a scuffle ensued in front of the Prescott Farms Grocery Store. At this point an eighteen year-old woman, who was a passenger in the vehicle, kicked the Chief during the scuffle. Chief Knowles suffered a fatal heart attack during the incident. He was 58 years old. He was survived by his wife, Rita, his two sons, Benjamin and Charles, his daughter Linda, and five stepchildren.